How to Search Google Fast from your Windows Mobile or Symbian Phone news and reviews for Windows Mobile Pocket PC, Palm, Microsoft Smartphones and Symbian cell phones. Optimizing your searches, like search time, relevant results, etc, has always been Google goals to make you satisfied. Their philosopfy steps on the foundations of the terms "fast search, fast email, fast everything". Now they have decided to reduce your search time with creating tine but nice apps, which will let you search Google straight from your Smartphone today screen. 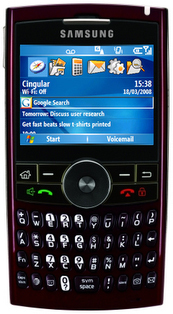 The application is called Google Search and is available for Windows Mobile operated Pocket PCs and Symbian phones. The software is plug-in for that put a Google Search shortcut onto the phone's home screen. The purpose of this shortcut is to reduce the time it takes for you to get answers from Google by eliminating the initial search steps like finding the browser application, opening it, and navigating to Google.com before entering your query. 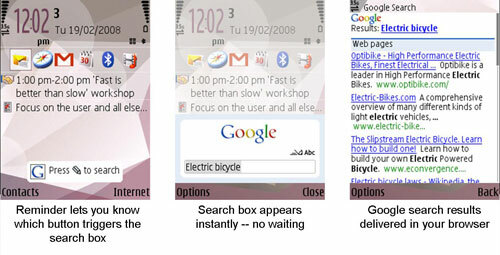 Here are Google Search screenshots from Windows Mobile and Symbian devices along with video how it works on Nokia phone.